On top of actually learning how the framework works, you also need to make sure your code, files and folders stay well structured and easy to maintain. It’s easy to skip over this stuff as a beginner and end up with a really messy set up that makes you cringe every time you look at it. A lot of frameworks either encourage or support the use of popular architectural patterns like MVC Model View Controller. The point of using these patterns is to create some form of organisation for your project – it really pays off when your projects starts getting larger and more complex. I came to Ionic with a background in Sencha Touch – if you’re making a similar transition be sure to take a look at the Learning the Ionic Framework as a Sencha Touch Developer series. Sencha Touch strongly enforces an MVC structure which can be a little tricky to get started with, but keeps the project very well organised. When I was getting started with Ionic, there didn’t seem to be any strict guidelines around how a project should be structured. This is both good and bad; good because it allows you the freedom to implement whatever structure you wish, bad because that can be hard to figure out. After a bit of searching I came to the conclusion that there are two main approaches to organising an Ionic application. I have dubbed them the easy way and the hard way. The easy way follows the standard structure of an Ionic application and splits up all the controllers and services into a separate module. The hard way which is perhaps more scalable organises the code by feature, rather than by class type. BONUS CONTENT: Want to take a beginner level Ionic course? Take a look at my Mobile Development for Web Developers course. Organising an Ionic application into class types is probably the most commonly used method right now. This method involves separating your controllers and services out into separate files rather than having them all within the single app.js file. We can create separate modules for our controllers and services, and then include them in the main module for the application. This might look something like this. 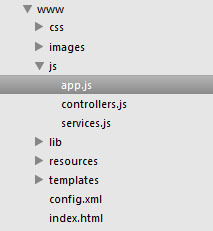 As you can see above each folder is some feature, and all of the code required for that feature is contained within it. Usually you would have all of your HTML template files in their own templates folder, but when organising by feature even they are included in the same folder as the rest of the code relevant to that feature. Whichever approach you do decide to go with, I highly recommend that you do at least invest some time into picking up some kind of architectural pattern – you’ll be glad you did in the long run.